Snow-capped peaks making for a chocolate box setting. Parked at top car park, Coniston. Itinerary – to bolt top level pitch for coming WRPC trip, and also to check lower adit for connection with upper levels. Steady walk up through snow fields saw us arrive at lower adit level. Phil sat it out while I had a look. 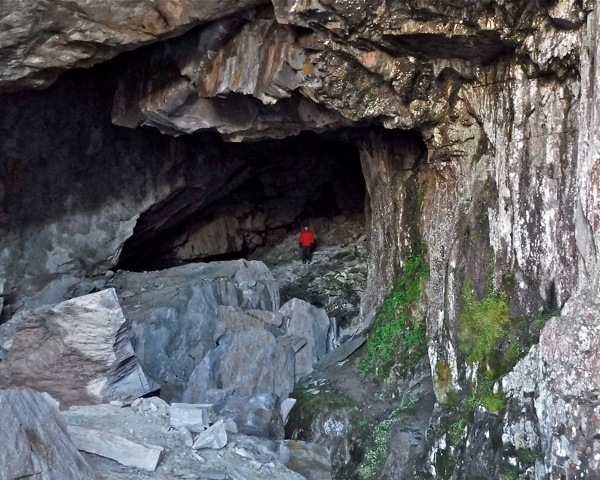 40m in the adit opened out into a split chamber with rising floors to huge loose boulders. 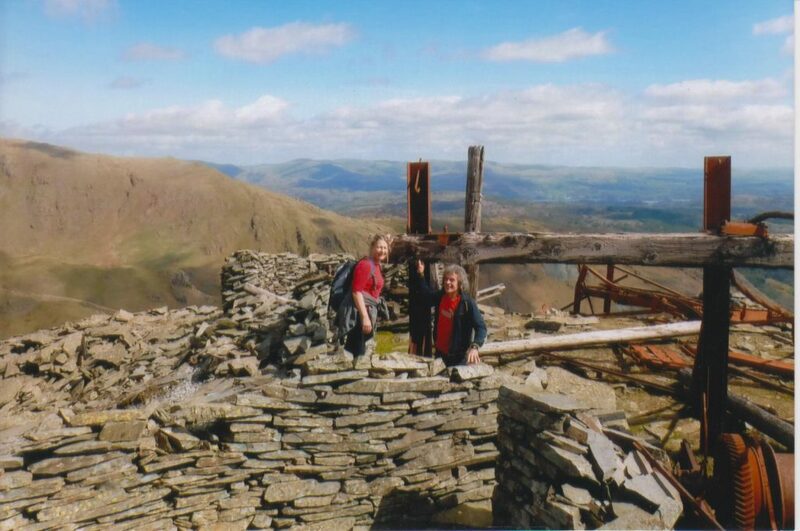 I returned to Phil to continue up Coniston Old Man to middle level. Phil entered at this adit. I continued to top level with scaffold pole which proved to be too short. Looking down from my vantage point at Phil across the huge chamber 50 metres lower was atmospheric to say the least. This must have taken a lot of time and effort to quarry in those times. Cables as thick as your arms and huge pulleys, not too mention the rail tracks, all half way up a mountain. I rappelled down using some old floor pins over the edge into a free hang to level below Phil. He set up a nylon road to his level with a length of climbing confidence line. On reaching anchors I noticed one which I had left 6 years previous. Reason, I was on a solo pull-through trip and the Petzl half twist was too tight to chance hence the sacrifice. I started to unlock the safety collar, to my amazement it turned, not problem. Also the locking bar hinge ran freely. What a tribute to this piece of equipment. We then had a climb up the great rubble heap to next level for tea and crumpets in candle-light: all electric off. I am an old romantic. Exiting out into bright Lakeland sunshine. We had some fun on the snow slope. Great day. Club Meet: Karina, Brian, Denis, Phil, Andy, Scot (22nd April 2017). After breakfast in Coniston, we bought provisions for the trip up to the entrance that lies 2,000’ above sea level, intending to do a pull-through to 3 levels lower and exit via the train tracks. We had 4 large rucksacks and 2 smaller ones – overkill, but we weren’t sure what we would meet as to the best of my knowledge the route had not been descended before – later proving to be correct, although we had Scot to lead the way. Parking at the top car park, we further sorted the packs and set off on a beautiful sunny day amongst a cast of thousands making their way to the summit of ‘The Old Man’, carrying a lot less than our team. 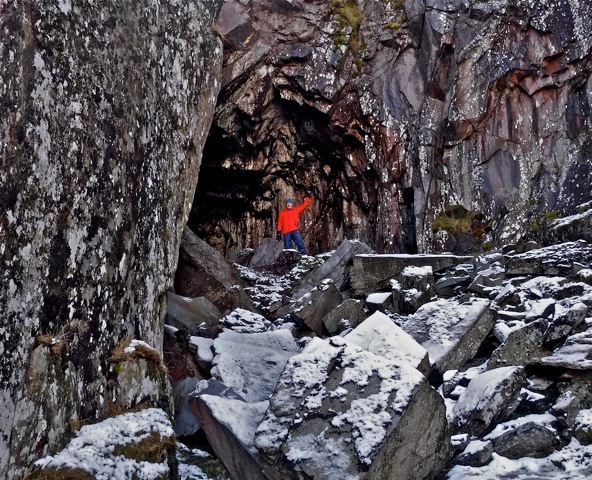 Walking up to the mine (Photo © Denis Bushell). Brian and Karina (Photo © Denis Bushell). Andy – camera, Scot – assistant, Karina – pastoral duties, the rest – donkeys to carry tackle. One hundred metres in the tracks split; left to a viewpoint of the main chamber and right to an ante-chamber via a steep ascent. This large chamber contains an equally impressive boulder field that we had to battle through to the head of the first pitch, where the terrain deteriorated a few metres from the edge and we had to remove a lot of scree and blocks before using larger boulders for an anchor for the descent. This done, Scot set off first and we then set up a reverse Fig-8 descent for Karina who was nervous and required some words of comfort for the descent. Andy Cole descending (Photo © Denis Bushell). We were reunited on level 2 with the only casualty being Andy’s sit-mat that was used as a rope protector and now required serious surgery. 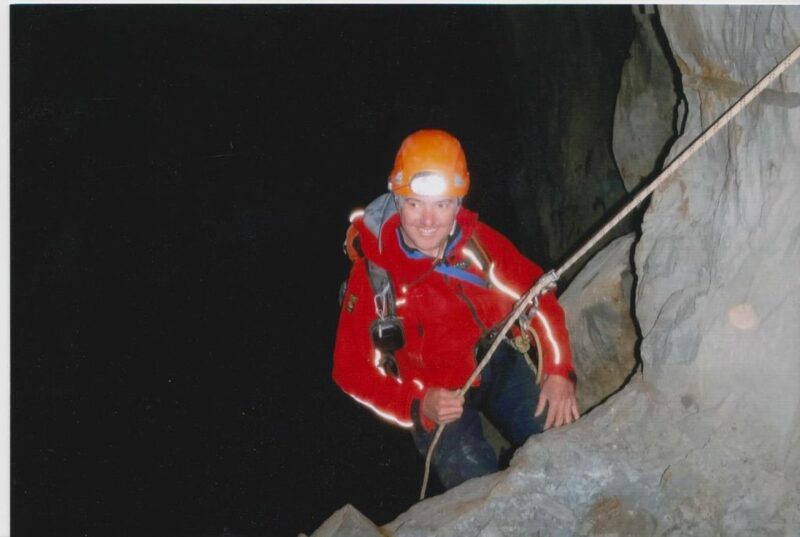 We ascended the huge rubble mountain to a chamber of large proportions for tea and crumpets, plus photos and after 20 minutes a reverse of the route saw us arrive at the next rappel into the Main Chamber. With an awkward take-off and greasy wall initially, a free-hang followed, with Karina being a bit more confident, although I had to prise her fingers from the ledge. 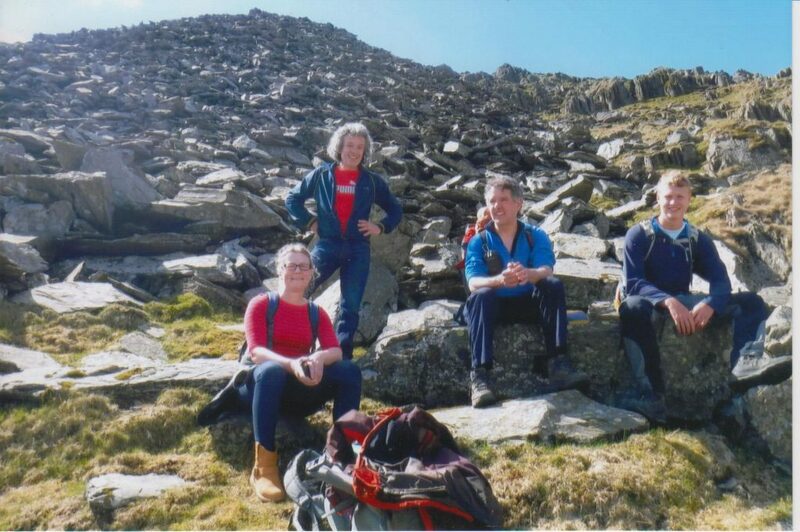 All down, the bags were packed and we followed the railway tracks through 2 large chambers that would have done The Dales proud, to exit to a blue sunlit day with a view across Coniston Water. Miner of the day was Karina and after kisses and cuddles we went our separate ways.